Atmospheric and gripping, Army of Shadows is renowned director Jean-Pierre Melville’s most personal film, and one of his most celebrated. Featuring Lino Ventura, Paul Meurisse, Jean-Pierre Cassel and Simone Signoret, it focusses on a group of intrepid underground fighters who must grapple with their own brand of honour in their battle against Hitler’s regime. Now celebrated as perhaps the finest of all films about the French Resistance during World War 2, Army of Shadows was heavily criticised upon its original 1969 release in France for its particular form of glorification of the Resistance. At the time, it appeared to be running against the tide of history, as attitudes to the war were about to take a U-turn, with a nation split between collaborationists and resisters. American film-programmers took their cue from the French critics, and on this basis decided not to give it a US release. It was not until over 35 years later, in 2006, that it was finally released in the US and was granted its due acclaim, including winning the New York Film Critics Circle Award for Best Foreign Language Film. 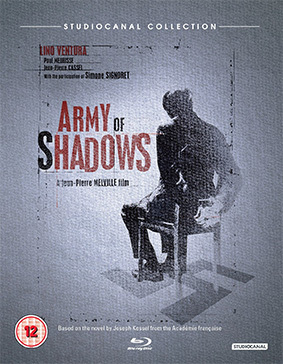 Released on US Blu-ray a couple of years back as part of the Criterion Collection (and coded region A), Army of Shadows will finally arrive on Blu-ray in the UK on 8th April 2013 from Studiocanal at the RRP of £24.99. Featuring a digitally restored print of the film, the disc will also contain a brand new one hour documentary extra Army of Shadows – The Hidden Side of the Story.